Is your business extracting best value from your information? Recent customers - The Incorporated Council of Law Reporting, Oxford University Press, Cambridge University Press, Scottish Council of Law Reporting and Scottish Natural Heritage. The role of the publisher is a rapidly changing one, not least the question of where the publisher can add value to the publishing process. Publishers have to deal with publishing content to multiple channels – print, online, ebooks; the re-purposing of content in different ways depending on the method of dissemination; the collection and collation of content in different formats from multiple contributors; the management of contributors; the management of, and support to, customers of online subscribed content. So many streams of content and so many interfaces. To design systems and processes to manage all of the above requires specialist knowledge and experience. Which is where we come in . . . The ever-increasing pace of developments in information technology is leaving many organisations struggling to reconcile the specialist technical knowledge underpinning much of its business processes with the business opportunities such technology affords. With over 24 years’ experience to draw on, MintoGordon can help organisations to develop and maintain a unified information strategy. We can help the business leaders identify a role for information technology in value creation and detail how it can inform and contribute to an organisation’s strategic objectives. Data: the numbers, the words and spaces. There are many software options for storing and managing data, from databases to spreadsheets to combinations thereof. But information? Information is the coherent combination of data which adds value to the core data set. How data is captured, managed and disseminated can have a profound impact on the traditional value chain in any organisation regardless of whether that information is for internal consumption or for wider dissemination. Are the different areas in your business working in isolation – data ‘solitary confinements’? Within the organisation is the IT a mysterious ‘black box’, a black art to the business leaders? Are the business objectives developed in isolation from the IT objectives? Is your business 'Extracting Best Value' from your business information? 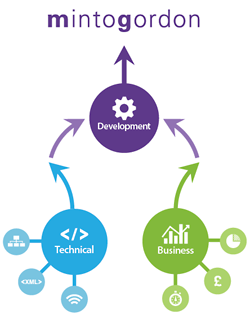 Talk to us about your technical and business development.